JRC Jordan Roofing Services Ltd specialise in all aspects of lead roofing projects. Because of it’s material properties, long lifespan and the fact that lead sheet roofing adds character to a building, this method of roofing is increasingly being used by architects and specifiers on residential projects. JRC Jordan Roofing Services Ltd have completed a wide range of projects from simple repairs of roof joints and welds all the way up to lead and zinc roofing projects on large residential properties. 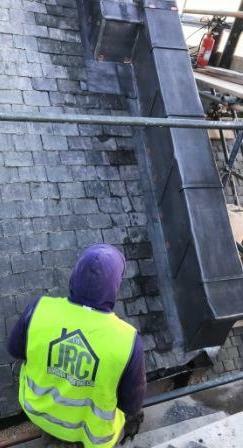 The image to the right is new code 6 leadwork capping to parapet wall on listed building in Culross, Fife.